From February 25th - March 7th 2012 the Trinidad and Tobago Chamber of Industry and Commerce has been leading a trade mission to Germany (Hamburg and Munich), The Netherlands (Rotterdam) and the United Kingdom (Birmingham and Manchester), with the aim to develop strategic partnerships in Europe. The mission was fully funded by the TradeCom Facility, which is an ACP Group Programme financed by the European Development Fund. Thursday March 1st a delegation of 9 Caribbean companies of different industries spent a day at the Chamber of Commerce in Rotterdam and had about 50 matchmaking conversations, organized by TRANSFER Consultancy. The delegation included five ICT companies, two food & beverage and two construction companies. During some of the conversations the companies were accompanied by Catherine Kumar (Chief Executive Officer of the Trinidad and Tobago Chamber of Industry and Commerce), Her Excellency Margaret King-Rousseau (Embassador of the Republic of Trinidad and Tobago to The Netherlands) and several senior officials. "On behalf of the “Trinidad and Tobago in Europe 2012” delegation, I would like to thank the team at TRANSFER for your dedication and the hard work that you have put into this trade mission. Your efforts have truly made our visit to Rotterdam a successful one despite our brief visit. From our initial assessment we have received very positive feedback from all nine companies and they will be following up with the potential partnerships now that they have returned. 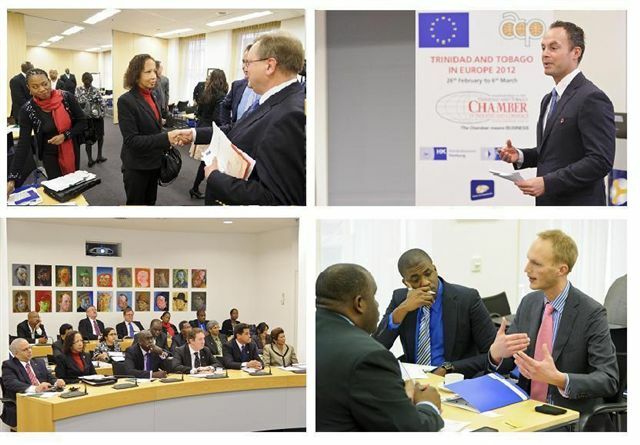 As a Chamber this mission was also quite fruitful and have aided us in forming linkages with the European Chambers." "Thank you very much for your thorough approach to this challenging Mission. We were very happy with the arrangements in Rotterdam and there seem to be real business prospects that are to be followed up by the participants. If the opportunity arises in the future for collaboration we will certainly be in touch with TRANSFER." For the reaction of Mr. Patrick Antoine, Group Strategic Policy Advisor of Carib Brewery (St. Kitts & Nevis) Limited, please consult the following document. Their trip around five cities, three countries and 137 business-to-business meetings in seven days resulted in 41 business leads. Ms Catharine Kumar considered this an extremely high ratio of success not normally experienced in trade missions and confirmed that the Chamber will take an active role in pursuing these leads and assist when necessary. The trip to Europe offered Trinidad & Tobago the opportunity to market T&T sectors that have been targeted by their Government for diversification and to take another step towards concretization of the Economic Partnership Agreement signed in 2008 between The Caricom/Dominican Republic and the European Union. For further information we would like to refer you to the newspaper articles published in the Trinidad Guardian and Trinidad Newsday.